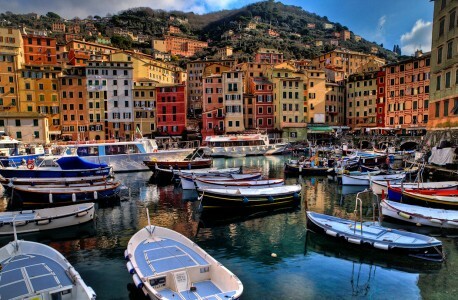 Camogli, Italy is a pretty little fishing village and a holiday resort on the Italian Riviera, in the province of Genoa. This nice holiday village attracts visitors with its lovely beach, its picturesque old town and the beautiful scenery with the surrounding green hills and the blue seas by the fishing harbor, as can be seen in this jigsaw puzzle. The seaside restaurants serve delicious Ligurian cuisine including fresh seafood. Every year in May, the village hosts a famous festival that celebrates fish. The hills around Camogli have walking paths and you can also take boat trips to nearby villages. It is no surprise that this small place is becoming more and more popular with visitors. Credit: Special thanks to Luca Boldrini for making the photograph used for this jigsaw puzzle available through the Creative Commons Attribution license. Visit Luca Boldrini's Flickr photostream. See all jigsaw puzzles based on Luca Boldrini's photographs.